Using a CT scanner to look beneath the surface, Alexandra Fletcher was able to reveal new details about one of the the oldest human remains in the British Museum collection, the Jericho skull. The so-called Jericho skull is among the oldest human remains in the British Museum collection. 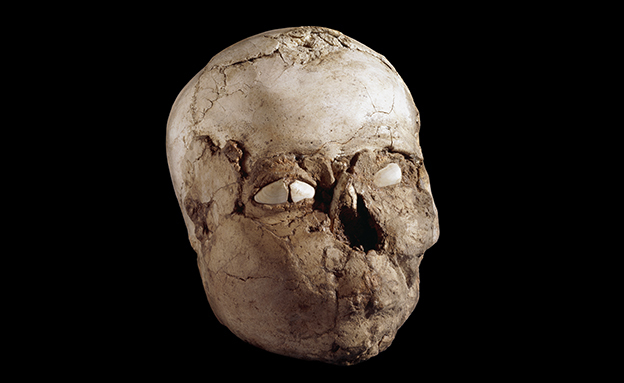 Thought to be between 8,500 and 9,300 years old, it is one of seven Neolithic plastered human skulls found together by Kathleen Kenyon during excavations at Jericho in 1953. The site is now located in the modern State of Palestine. Plastered skulls are thought to have been an important part of Neolithic rituals involving the removal, decoration and collecting of skulls. There has been a lot of debate about why particular skulls were chosen for this. Some archaeologists link them to the worship of elder males. Others suggest they were selected according to their shape or the status of the person in society. Some argue that they are portraits of revered members of the community. None of these theories are completely convincing, but a general agreement has emerged that the worship of ancestors may be involved. The Jericho skull shown facing sideways. The lips and remaining ear are modelled in plaster. View of the back of the skull showing the hole made in the bone and the plaster base. This ‘skull’ is actually a cranium because the lower jaw has been removed. There is also a section of bone missing on the left side towards the back where the soil filling inside can be seen. The cranium was decorated with a thick layer of plaster, shaped to look like a human face, which covers all of the upper jaw and finishes at the eye sockets and temples. Plaster has also been used on the base, so the skull sits upright on its own. Frustratingly, the plaster covers the parts of the skull which provide clues about who the person was and what happened to them. Therefore, over 50 years after it had been found, we still knew very little about the person whose skull this was. Physical anthropologists (experts in the human body) Theya Molleson (Scientific Associate, Natural History Museum) and Jessica Pearson, looked at how much the sutures (the joins between the skull’s bones) had closed and were able to suggest that it was a mature adult, but we needed to see beneath the plaster to find out more. The Jericho skull in the radiography laboratory. The grey cassette behind the skull contains the X-ray film. The Museum has equipment for taking X-rays (radiographs) and my colleague Janet Ambers was able to X-ray the Jericho skull, but the soil filling the skull made it difficult to see everything inside clearly. We were therefore very lucky to be offered the chance to use a micro-CT scanner and its associated software by the Imaging and Analysis Centre, at the Natural History Museum, and the Department of Surgery and Cancer at Imperial College, and to work with two of their experts, Richard Able and Crispin Wiles. The images created by the CT scans allowed us to look beneath the surface, revealing new details about the person that died so long ago. The scans confirmed that the skull had belonged to a mature adult who was more likely to have been male than female. We were also able to look at his upper jaw, where we found broken teeth, tooth decay and damage done to the bone by abscesses; all of which fitted well with the person being a mature adult. The back teeth (second and third molars) never developed and the second incisor on the right side is also missing. It is difficult to be sure without other examples to look at, but these teeth may have failed to grow because of inherited traits that are relatively rare. The scans also allowed us see that the shape of the person’s head had been changed during their lifetime. It is possible to alter the shape of a skull by binding or bandaging the head during childhood. When we looked at the outside of the Jericho Skull we could see a slight dip in the surface running over the top of the head from ear to ear which suggested that something like this had been carried out. The X-rays and the CT scans, showed changes in the thickness of the skull bone and, as such alterations can only be made while bone is forming and growing, this must have happened from an early age. This work has also revealed new details about how the skull was prepared for plastering. The CT scans showed concentric rings of grits within the soil and a ball of finer clay sealing the access hole at the back. This suggests that the soil was deliberately put inside the skull to support the surface as the plaster face was being added. It is possible that the round piece of bone cut away to form the access hole was originally put back after the cranium had been filled. Although it was subsequently lost, its earlier presence may explain why the soft soil filling has survived so well. The work has significantly changed our knowledge of how this person’s skull was treated both during life and after death, making clear the benefits of the long-term care for human remains offered by museums. This previously enigmatic individual is now known to be a old man who suffered badly from toothache. The deliberate re-shaping of the skull also suggests that for this individual, physical change and social status may have been linked, something seen across the history of humankind. The use of imaging techniques has provided us with new areas of investigation and suggested new ways to view plastered skulls; as a reflection of an individual’s life rather than just a treatment for the dead. The Jericho skull can be seen in the British Museum in Room 59, Ancient Levant, The Raymond and Beverly Sackler Gallery. Alexandra Fletcher is co-editor of a recent book, Regarding the Dead: Human Remains in the British Museum published by British Museum Press, which discusses the ethical and practical issues associated with caring for human remains and presents some of the solutions the British Museum has sought to curation, storage, access and display. The book also discusses some of the research that has developed our understanding of these individuals’ past lives.